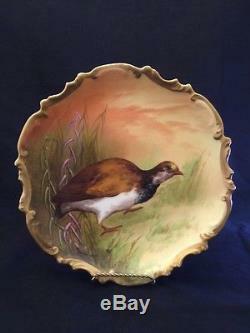 This is hand painted porcelain French Limoges charger plate that is finely painted with game bird in a beautiful landscape background with beautiful thick gold scalloped edge. Its factory drilled to wall mount, or you can certainly use it as a cabinet display. Excellent vintage condition, no chips, cracks, or repairs, some light ware to gold. The backstamp is Coronet, dates back to beginning of 1900's. Measures: 10 3/8 in Diameter. A great piece for an avid collector. Most of the items I sell are either vintage or antique, and are primarily acquired from Estate Finds. In most of the cases they are not new, and will have wear commensurate with it's age. I always take pictures of the actual item and make. Every effort to photograph the items in such a way as to show all features and characteristics as clearly as possible. Therefore it serves as part of my description. Due to the nature of my items I do not claim any expertise to the items that I sell. If you have any questions, or need additional pictures, I will answer you with pleasure. Please check my other items, as I have a lot more antique/vintage items that I list daily. The item "Beautiful Vintage Limoges Hand painted Coronet Game Bird Plate, Artist Signed" is in sale since Sunday, July 31, 2016. This item is in the category "Pottery & Glass\Pottery & China\China & Dinnerware\Limoges". The seller is "ggrrss1957" and is located in New York. This item can be shipped to United States, Canada, United Kingdom, Denmark, Romania, Slovakia, Bulgaria, Czech republic, Finland, Hungary, Latvia, Lithuania, Malta, Estonia, Australia, Greece, Portugal, Cyprus, Slovenia, Japan, China, Sweden, South Korea, Indonesia, Taiwan, Thailand, Belgium, France, Hong Kong, Ireland, Netherlands, Poland, Spain, Italy, Germany, Austria, Israel, Mexico, New Zealand, Philippines, Singapore, Switzerland, Norway, Saudi arabia, Ukraine, United arab emirates, Qatar, Kuwait, Bahrain, Croatia, Malaysia, Brazil, Chile, Colombia, Costa rica, Dominican republic, Panama, Trinidad and tobago, Guatemala, El salvador, Honduras, Jamaica, Antigua and barbuda, Aruba, Belize, Dominica, Grenada, Saint kitts and nevis, Saint lucia, Montserrat, Turks and caicos islands, Barbados, Bangladesh, Bermuda, Brunei darussalam, Bolivia, Ecuador, French guiana, Guernsey, Gibraltar, Guadeloupe, Iceland, Jersey, Jordan, Cambodia, Cayman islands, Liechtenstein, Sri lanka, Luxembourg, Monaco, Macao, Martinique, Maldives, Nicaragua, Oman, Peru, Pakistan, Paraguay, Bahamas, Viet nam.